Kara Shay Thomson as the Queen of Sheba. 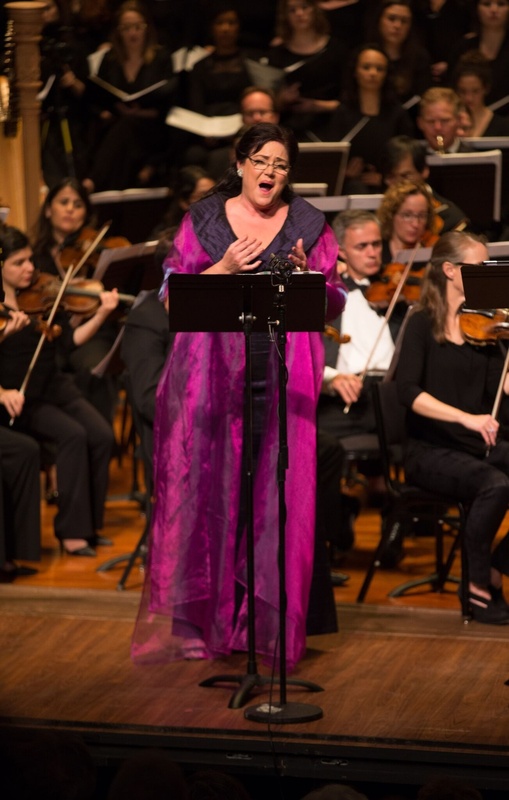 “La Reine de Saba,” a grand five act opera composed by Charles Gounod in 1862, reentered the stage for its American premiere on Sept. 22 at the New England Conservatory’s Jordan Hall. This tale of love, betrayal, and envy lost its place in common operatic repertoire in the early 1900s, only to be revived by the toils of the Odyssey Opera’s music director, Gil Rose. After traveling to countless libraries across the US and Europe to conduct research and rummage through old scores, Rose resurrected the lively work which features a grandiose 70-piece orchestra, a 60-piece chorus, and eight Boston-based singers. Though it lacked a traditional set and direction, this opera captured both the strength and vulnerability that is central to the themes of the work. This opera follows the heartbreaking drama of a scandalous love triangle between King Solomon (Kevin Thompson), Queen Balkis of Sheba (Kara Shay Thomson), and an architect called Adoniram (Dominick Chenes). Though the Queen is betrothed to Solomon, Adoniram quickly falls for her. At the same time, the story focuses on three of Adoniram’s workers: Amrou (Matthew DiBatistta), Phanor (David Kravitz), and Methousael (David Salsbury Fry), who are full of scorn after being denied higher wages. They seek to sabotage the casting of one of Adoniram’s latest bronze works. Things only get more complicated when Balkis begins to fall for Adoniram and becomes caught between her feelings for him and her duty to Solomon. The plot is a complex mixture of romance and violence that is perfectly encapsulated by the music. There is a stark contrast between the subdued background of the third act and the tempestuous chromatic swells of the fifth act. At times, the music pivots entirely, becoming soft and emotional like when Solomon uses a pained vibrato to curse Balkis for leaving him. The show’s set is very minimalistic, with Jordan Hall largely left alone. Lining the back of the stage is the chorus, a massive contingent that not only adds depth to the music, but whose presence, especially when they all stand up at once, adds a sense of visual grandeur. Because the performance is staged like a concert, the show lacks the traditional layer of dynamism afforded by opera’s acting, props, set design, etc. This does not limit the performance — in fact, its simplicity only serves to accentuate the passion and skill of the performers. Kevin Thompson’s bass solos are sonorous and powerful, uplifted by the orchestra’s accompaniment, but still able to stand on their own a capella. Chenes’s tenor serves as a wonderful contrast — just as beautiful but embodying a different, more emotional and impulsive tone. Kara Shay Thomson is the obvious star of the show. When she first appears onstage, dressed in stark magenta amid a sea of muted costumes, she shines. She is able to express the most peaceful contentedness when singing with her servants in the woods. This piece is pure, unbridled happiness, accentuated by a playful English horn and clarinet duet reminiscent of Edvard Grieg’s iconic “Morning Mood.” She can also be antagonizing, a match for King Solomon’s impassioned fervor. She manages to invoke a sense of primal sadness in response to Adoniram’s death with a raw cry that leaves the viewer with a deep remorse and an overwhelming urge to applaud. Against 19th century conventions, the female character Balkis is the true heroine of this story. The story hinges on her bravery and her ability to break arbitrary social convention to attain her own happiness. Despite this superhuman bravery and passion, she remains grounded and humble. In spite of her little-known existence, the Queen of Sheba should join the ranks of famous female icons like Helen of Troy and Wonder Woman — the figure we need in today’s contemporary feminist society. Local opera fans will have a chance to hear a preview of the forthcoming Lowell House production "Solomon and Balkis,"